While I still enjoyed the movie... it wasn't as good as part 1. The storyline... while kept me interested... wasn't as good as the first. The comedy definitely wasn't there like it was in the previous movie. But over-all not a bad movie. Though I did expect more from it. I think one problem was that they stretched it out too long. It may have been better if they stuck with no more then a 2 hour movie. While I can see myself watching it again... I wouldn't as much as the first part. But it is worth seeing though. 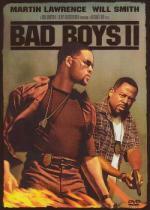 Martin Lawrence played Marcus Burnette in the previous movie Bad Boys 2. I'll probably just stick with what I haven't seen yet... and watch Open Season. Boog (Martin Lawrence), a domesticated grizly bear with no survival skills, has his perfect world turned upside down when he meets Elliot (Ashton Kutcher), a scrawny, fast-talking mule deer. They join forces to unite the woodland creatures and take the forest into nature's control! It's a film for the whole family that Shawn Edwards (Fox-TV) calls, "a fun story loaded with lovable characters!" Not really a bad film... but not a great one either. I don't see myself watching this one too often. But sure I will watch it again at some point. There is a few good scenes... but for the most part found it a little too silly. As well as a gross joke or two thrown in. I did like when Boog and Elliott broke into the store and ate all that candy. Probably the best scene in the movie. I thought the cast did well though. Worth seeing... but don't have high hopes for this one.